Employment can have a positive impact on people’s mental health and wellbeing. A recent study has found that people’s wellbeing is higher if they have a job than not – even if controlled for their increased income. 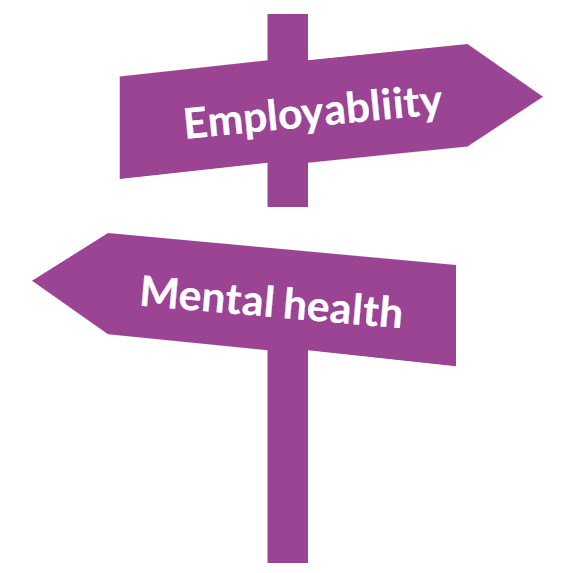 In the past two blogs, we have discussed mental health in the context of employability, now we explore employability in the context of mental health services. So, what can mental health services gain from integrating employability into their service provision? And what has been happening in this area? Many mental health services are now conceptualising their services using a recovery journey, similar to the concept that underpins many alcohol and drug services. Recognising the role that work can play in people’s recovery, Glasgow’s Health and Social Care Partnership funds a range of employability services for those with health and social care barriers to employment, including mental health. These services see employability as part of a recovery journey. During our evaluation of their employability services, we got to know Mental Health Employability Services across all stages of the employability pipeline. These started with pre-employability services providing clients who are not job-ready with the opportunity for “meaningful activity”. At the other end of the journey was the provision of Individual Placement and Support (IPS) schemes where people receive individualised support to gain competitive employment. IPS schemes challenge the assumption that competitive employment is too stressful for people with mental health problems. Instead, building on the insight that someone’s desire to work is a strong predictor of success in achieving and sustaining employment, they work with everyone that is motivated and committed to move into work. Access to IPS support is now available as part of the national Fair Start Scotland service. Bringing people into positive destinations, volunteering or employment, was also the goal of a recovery service of the Scottish Association for Mental Health which we evaluated recently. During our research, participants of the programme emphasised how important it was for their recovery, and for managing their mental health, to fill the void that their addiction has left behind. For many of these participants, working towards employment, no matter how far away employment was, played an important role in filling this void. While moving into employment can itself be stressful, there is more to gain from employment than income: a structure to their everyday life, meaningful activities as well as social connections and support. The extent to which this works of course depends on the quality of work that people move into. There is a considerable evidence of the negative effects of social isolation on people’s physical and mental health, for example, social isolation increasing the likelihood of depression. The importance for everyone to have meaningful connections is now high on the political agenda: in December last year Scotland published its first national strategy – “A Connected Scotland” – on tackling social isolation and loneliness and building stronger social connections. The Strategy outlines the importance of empowering communities, tackling stigma, and of supporting an infrastructure and providing opportunities for people to connect. Our work has shown that for people in recovery – for example previous drug users who had to leave their previous networks of active users – work or volunteering can be an opportunity to re-build their social networks. Employment can make a meaningful contribution to keeping people’s social isolation in check and can play a vital role in their recovery. While we have seen employability services integrating mental health support elements into their programmes and mental health services employability elements, there is still more scope for organisations to align their service offer, share resources, and provide coordinated care. We are excited to be working alongside our clients to help them ensure that both mental health and employability clients receive the right type of support at the right time.